Clare is a teenager living in a world revolutionised by d-mat, technology which allows anybody to teleport to almost anywhere in the world in minutes. When a mysterious spam message goes around, promising the recipient the ability to change anything about themselves using something called "Improvement" most of her peer group dismiss the message as a hoax. Clare is tempted to try Improvement to change her big nose but it is her friend Libby who actually goes through with using it to remove her hated birth mark. Clare soon finds out that improvement is more than a simple hoax and sets out to try and save her friend from the possibly deadly consequences. She enlists the aid of Libby's charismatic boyfriend Zep, a "stainer" (non d-mat using) boy named Jesse and a mysterious new friend she knows only as "Q", and makes a cross-country journey without the convenience of d-mat to try and find some answers. Sean Williams is my favourite Australian sci fi author, but this is the first of his young adult books I have read. Jump brings back the premise, and even one or two of the characters, from one of his adult novels, The Ressurected Man (1998). I admire the way that when new technology is introduced in his stories he really thinks through all the possible implications of its use. Teleportation and machines that make any food or drink on command have been around for a while in science fiction books and tv shows like Star Trek but these books explore their use in an interesting way. D-mat makes it possible to telecommute daily to the other side of the world. Since access to water and transportation is no longer an issue you can build a suburb in the middle of a desert, jump randomly around the globe for laughs, and even travel into space in an instant. Fabbers (machines that can create anything non living, like a super advanced 3D printer) can create anything from a new outfit to a cup of coffee in moments, changing the way objects are valued. The dark side of this technology is that, like any other invention, it can malfunction or be misued. Even when it functions correctly, d-mat presents certain philosophical problems. Technically, using it kills you. A person who steps into a d-mat booth is reduced to their component atoms. The pattern their atoms formed is saved and they are recreated from new matter at the other end of their journey. Various characters in Williams' books debate whether this process changes a person in a significant way, or whether they remain essentially the same. It's the old philosophical question of Theseus' ship, rewritten for a new age. "Stainers", who object to d-mat, believe that someone who uses it is irrevocably changed. Some even go so far as to become terrorists, trying to destroy the system which they see as a threat to humanity. It's not all philosophy, however. Jump is also an action packed adventure that becomes very hard to put down towards the end. It's a gripping read, without the grimness of some young adult series like The Hunger Games, and doesn't rely too heavily on a romantic subplot to keep things interesting. Clare is a likeable, active heroine who finds herself abruptly shaken out of her cosy, self absorbed teenage life and into the real world and handles the strange new situations she faces admirably. I look forward to reading about her further adventures. 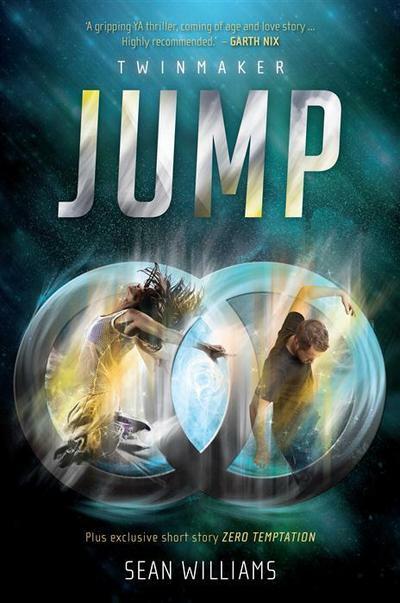 Jump is the first book of the Twinmaker trilogy and the intriguing ending will make you want to read the next one. Book two is due to be released in November 2014. What are you reading in June 2017? How do you get rid of head lice?